Despite immediate appearances, this book is not primarily a hermeneutical exercise in which the superiority of one interpretation of canonical texts is championed against others. Its origin lies elsewhere, near the overlap of history, psychoanalysis, aesthetics, and social theory of the usual kind. Weber, Pareto, Freud, W. I. Thomas, Max Scheler, Karl Mannheim, and many others of similar stature long ago wondered and wrote much about the interplay between societal rationalization and individual rationality, between collective furor and private psychopathology—in short, about the strange and worrisome union of “character and social structure” (to recall Gerth and Mills). Pondering the history of social thought in this century can lead to the unpleasant realization that such large-scale questions slipped away, especially from sociologists, sometime before World War II. Or, if not entirely lost, they were so transformed in range and rhetoric that a gap opened between contemporary theorizing and its European background. Perhaps this partly explains Weber’s continuing appeal. 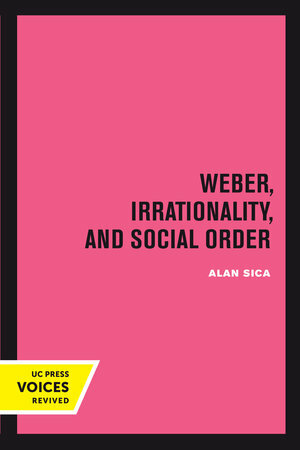 By dealing with him, one might again broach topics long at odds with “social science” of the last forty years.—From the Preface This title is part of UC Press's Voices Revived program, which commemorates University of California Press’s mission to seek out and cultivate the brightest minds and give them voice, reach, and impact. Drawing on a backlist dating to 1893, Voices Revived makes high-quality, peer-reviewed scholarship accessible once again using print-on-demand technology. This title was originally published in 1988. Alan Sica is Professor of Sociology at the Pennsylvania State University.